The Swiss economy has far more to lose than its largest trading partner from Sunday’s 50.3 pct vote to exit the treaty on the free movement of people. For the European Union, the rejection of its vision of solidarity comes just when its leaders most need a sense of common purpose. 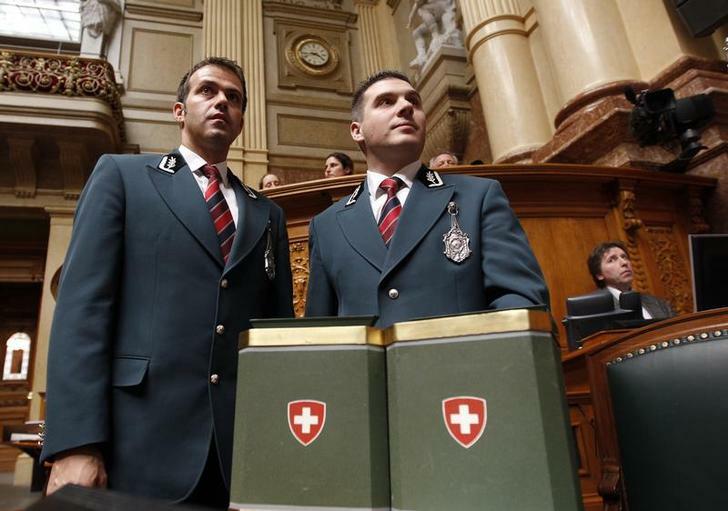 Swiss ushers stand next to ballot boxes before an election vote during the first parliamentary session at the Bundeshaus (Swiss Parliament). Swiss voters on Feb. 9 narrowly backed proposals to reintroduce immigration quotas with the European Union. The 50.3 percent vote calls into question bilateral accords with the EU and could irk multinational companies. While Switzerland is not a member of the EU, its immigration policy is based on free movement of citizens to and from the EU, with some exceptions, as well as allowing in a restricted number of non-EU citizens. That pact on free movement of people, which came into force 12 years ago, was signed as part of a package of agreements with the EU. In the last five years, net immigration to Switzerland, including both EU and non-EU movements, has declined from 88,167 to 45,170 people. The country’s population is 8 million people.